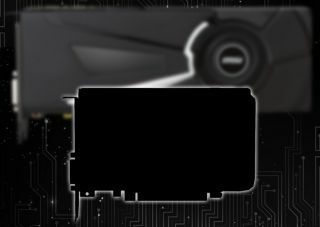 MSI promises this mystery card will deliver a big punch. With the gains in power efficiency that Nvidia's Pascal architecture delivers, it's probably only a matter of time before the GeForce GTX 1080 or 1070 is squished into a small form factor card. As evidenced by a pictured MSI posted to Facebook, that time appears to coming soon. The image shows the outline of a smaller graphics card sitting in front of one of MSI's distinct looking Aero cards. MSI uses the Aero designation on three of its GeForce GTX 1080 cards and two GeForce GTX 1070 cards, each one featuring a "brand new black and white design, crafted from premium materials." The cooler design matches the blurred shot of the card in the background of MSI's Facebook post. That would be an odd thing to include if the smaller card was not going to be one of Nvidia's top-end parts, plus part of the caption reads, "Small package, BIG punch." That's some not-so-subtle hinting going on here. Take this last part with a grain of salt, but according the folks at Videocardz, a rumor site that is just as likely to be wrong as it is right, the smaller card is not exclusive to MSI. The site claims it's a new model from Nvidia, which means that other graphics card makers will offer their own custom versions as well.